The first month of the year has been a very active one for online gaming developers. All the big players in the gaming industry are looking for a fast start out of the gate. Innovation coupled with exciting game features have been a common trait among all the new video slot game releases. Recently, NetEnt’s latest offering highlights on the company website. The title of the new release is Strolling Staxx: Cubic Fruits. This video slot follows in the footsteps of Neon Staxx and Butterfly Staxx. Each of those games turned into fan favorites and it is a good bet that Strolling Staxx also gains wide-scale appeal. When Does NetEnt Slots Release the Cube-Based ‘Strolling Staxx’ Video Slot? The newest member of the Staxx gaming family is a five-reel, three-row video slot that features Colossal symbols. Filled with entertaining features and a new, fun creative direction, the game is a cube-based design. Any symbol can appear as a Colossal or as a stack. They can also activate the Strolling Staxx Re-Spins. When the Bonus Bet is activated, players will have the chance to land more Colossal symbols. This also allows players to gain additional Strolling Staxx Re-Spins. Strolling Staxx is the company’s second release in 2019. Turn Your Fortune was released earlier in January with excellent feedback on its game design. It is shaping up to be a busy year for one of the top gaming developers in the global market. NetEnt has made a commitment to create up to 35 new in-house and branded games over the course of the year. Many are already in the planning stage and earmarked for widespread distribution. The company’s goal is to produce new content that meets all the various tastes of players in all of the markets it serves. As a true pioneer in the gaming industry over the past 20 years, NetEnt has become synonymous with providing premium gaming solutions to the world’s most successful online casino operators. It has been able to drive growth in the online segment of the real money casino gaming industry. Through constant innovation with a keen eye towards consumer appeal, it has also been able to stay at the top of its game over the past two decades. The ultimate goal as stated on the NetEnt website is to help its customers be ‘unique, premium, informed and ahead, all at the same time’. 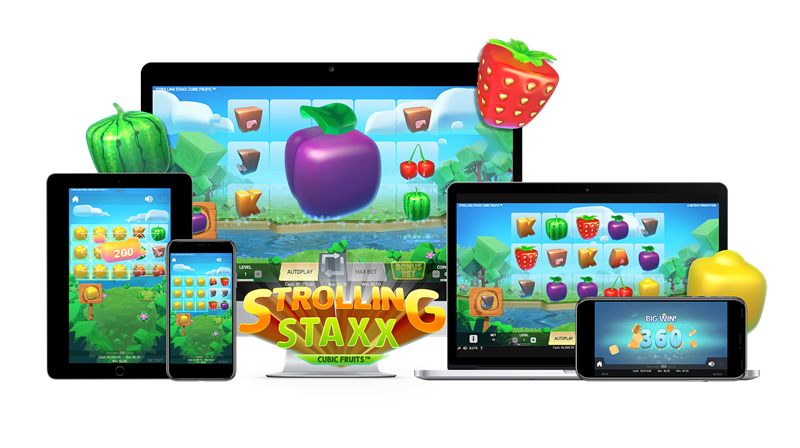 • Source: NetEnt lets cubic fruity slot adventure Strolling Staxx out of the box From Netent.com On January 24, 2019. See How NetEnt Slots Releases the Cube-Based ‘Strolling Staxx’ Video Slot Machine In The Latest Casino Gambling News Articles.